Time & Tide, Vol. 6 includes topics researched in each of the decades since the SHS foundation. To celebrate the 60th. anniversary we have included “Profiles of Early Members” and an “Index of Papers in the SHS Archive”. 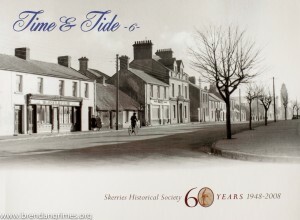 Skerries Historical Society is delighted to share with you this beautifully produced compilation. Volume 6 – please choose your shipping destination.